SEVERAL ENVIRONMENTAL GROUPS have come together to condemn the Minister for Culture’s new conservation proposal to protect the endangered hen harrier. An Taisce, the Irish Raptor Study Group (IRSG) and the Irish Wildlife Trust (IWT) are calling on Minister Josepha Madigan to retract the draft threat response plan being developed by the National Parks and Wildlife Service to save the hen harrier from regional extinction and further severe population decline. The IRSG says the hen harrier, once widespread throughout the country, is now Ireland’s rarest declining breeding bird species due to habitat loss and has suffered a 50% decline in numbers over the last 40 years. The groups want the plan retracted as they believe it will mean the hen harrier will be forced to breed in unsuitable areas. There are currently six Special Protection Areas (SPA) designated for the protection of the hen harrier. But the groups claim that the plan would include large-scale commercial conifer forestry in these areas. This type of land is the main threat to the rare ground-nesting bird as it replaces the upland bog and marginal farmland on which it depends. It is extremely disappointing to see a draft document with no apparent conservation objectives set, no targets defined, no deliverables, and no explanation or way of measuring how proposed actions will yield any immediate, short or long-term positive effects for the hen harrier. However, the Department said that it believes the groups’ critique to be premature as draft plans are currently being considered following consultation with a committee “which includes representatives from a broad range of relevant bodies and sectors, including the groups referenced”. According to a Department spokesperson, the six SPAs for hen harriers included large areas of forestry at the time they were designated, as the birds bred there at the time. But the groups have also accused the Department of ignoring the “science” as they say over 52% of the land in hen harrier SPAs has been lost to forestry, and that there are now more hen harrier outside of these protected areas than inside. In response to that claim, the department spokesperson said the National Parks and Wildlife Service and the departments involved “take all scientific information into consideration”. Following the department’s remarks, Pádraic Fogarty campaign officer for IWT said its point about the criticism being premature is “nonsense as this plan has been in the works for five years”. “The National Parks and Wildlife Service has presented a draft hen harrier Threat Response Plan that is not a conservation plan, but a blueprint for the continued destruction of our protected sites and the extinction of the hen harrier,” he said. The IRSG said that if proposals are not fully retracted then its next steps would be to pursue the option of a legal challenge to the plan through the Directorate-General for Environment of the European Commission. Email “Environmental groups enraged by protected sites plan for endangered hen harrier ”. 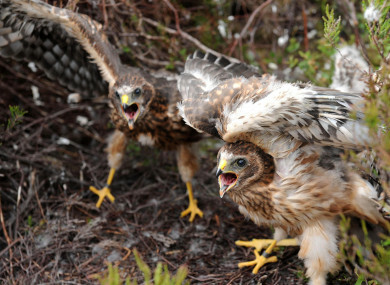 Feedback on “Environmental groups enraged by protected sites plan for endangered hen harrier ”.